Satisfy your chocolate craving without the guilt! 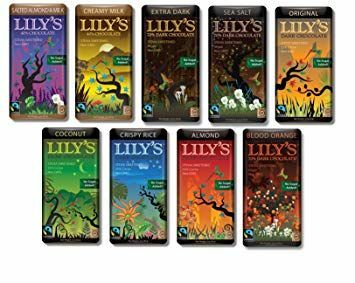 Lily’s Chocolate Bars are fair trade, non-GMO, certified gluten free chocolate bars that come in a variety of mouthwatering flavor combinations like dark chocolate and blood orange, dark chocolate and salted almonds, and caramelized and salted milk chocolate. Here’s the special catch – they have no sugar added! That’s right, no sugar. They are sweetened with Stevia, a zero calorie natural sweetener which is 200-300 time sweeter than sugar, so they have 20-25% fewer calories than your standard chocolate bars. Don’t worry though, you won’t miss the sugar, and they will certainly satisfy your chocolate cravings! We didn’t notice any aftertaste or off-putting mouthfeel that you can sometimes experience with artificial sweeteners. Each bar is considered 2 servings and has 160-190 calories. Lily’s is also proud to donate a portion of their profits to grassroots non-profits that support childhood cancer survivors. Good news all around for chocoholics, thanks to Lily’s Chocolate Bars!